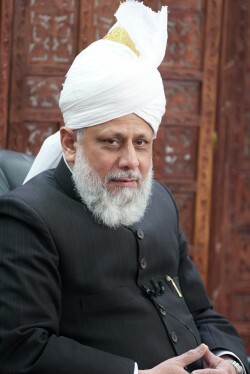 October 2011 Alislam-eGazette: The Holy Prophet Muhammad, may peace be on him – For Christians, To be Born Again in Islam! Have you any notion what was the strange event that occurred in the desert country of Arabia when hundreds of thousands of the dead were revived within a brief period and those who had been misguided through generations put on Divine color, and those who were blind obtained sight, and those who had been dumb began to speak of the understanding of the Divine, and the world underwent a revolution which had never been seen or heard of before? It was the supplications during dark nights of one who had lost himself in God which raised a clamor in the world, and manifested such wonders as appeared impossible in the case of that unlearned helpless one. Send down Thy blessings and peace, O Allah, on him and his people according to the amount of pain and anguish he felt for his Ummah, and pour down upon him the lights of Thy mercy forever. This is an hour and a half movie or documentary about Saladin and Richard the Lionheart. If the movie inspires you in some ways, remember that the Latter Days, which is our times, are an era of Jihad with pen and the Holy Prophet Muhammad, may peace be on him had prophesied this. Come join the Ahmadiyya Muslim Community and volunteer your services for the Muslim Times. When Saladin finally captured Jerusalem, he did not kill the Christian population of Jerusalem, the descendents of the crusaders of the First Crusade, who had killed each and every Muslim inhabitant of Jerusalem during the First Crusade. He was following in the footsteps of his master, the Holy Prophet Muhammad, may peace be upon him, and trying to mimic his mercy and forgiveness that he had shown to the polytheist population of Mecca a few centuries before. The picture is of a Statue of Saladin in Damascus. The issue of blasphemy is a hot issue that remains in news particularly in Pakistan. In 2010, a Christian woman Asia Bibi, who was charged with blasphemy in Pakistan, made the international headlines. But charging Asia Bibi under the blasphemy law did not apparently quench the radical thirst of the clerics of Pakistan. A Muslim cleric offered $6,000 to a person who would kill Asia Bibi. Tragically, the late governor of Punjab, Salman Taseer, who visited Asia Bibi in prison, was later gunned down by his own security guard, Mumtaz Qadri. Salman Taseer’s crime was to speak up for the victims of blasphemy law. The insanity continued unabated when after few weeks of the murder of Salman Taseer, a Catholic and Minister for minorities, , Shahbaz Bhatti, was assassinated allegedly over his stance on blasphemy laws. The issue of blasphemy has once again reared its ugly head: the death penalty imposed by anti-terrorism court against Mumtaz Qadri, the murderer of Salman Taseer, has been reversed. The issue of blasphemy is not a new phenomenon. The instances of blasphemy are found throughout recorded human history. The Holy Quran, for example, points out very clearly that all the prophets and messengers of God were persecuted, harmed, abused and mocked, not only during their life time but also after their demise. “Alas for My servants! There comes not a Messenger to them but they mock at him.” (36:31) “Then We sent Our Messengers one after another. Every time there came to a people their Messenger, they treated him as a liar.” (23:45) Noah, Abraham, Lot, Saleh, Shuaib, Moses and Jesus, peace be on them all, just to name a few, were all mocked and blasphemed by their enemies and opponents. Questions naturally arise: How did Prophets react to blasphemy? Did they ever punish the blasphemers? What was the end of those mockers and blasphemers? These verses make it abundantly clear and manifest that all the messengers observed extreme patience whenever they were blasphemed and they never tried to punish or respond to those blasphemers violently. All those mockers, blasphemers and enemies faced deadly consequences. Another common element in their stories is that all the enemies were punished by God, and this is one supreme reality that can never change; “There is none that can change the words of Allah” (6:35). Muhammad’s brilliance lay in politics as well as spirituality. One of the most extraordinary events to take place during this time was the drafting of the Covenant of Medina (Sahifat al-Madinah), what some consider to be the world’s first constitution. It was a treaty and city charter between the Arabs and Jews of the city. All groups (Muslims, Jews, and non-Muslim Arabs) pledged to live in civic harmony, governed by mutual advice and consultation. The Covenant bound these varied groups into a common defense pact and stipulated that the Jews of the city were one community with the Muslims, that they were free to profess and practice their religion and that they were entitled to all the rights pertaining to the Muslims. This amazingly foresighted document was a revolutionary step forward in civil government. Despite the ultimately tragic end of Muslim and Jewish cooperation in Medina, this blueprint of inter-religious tolerance would serve Islam and its subject peoples well in the future. The Dacheng Hall, the main hall of the Temple of Confucius in Qufu. The Teaching Company vide course titled Confucius, Buddha, Jesus and Muhammad starts with the description of this book, The 100: A Ranking Of The Most Influential Persons In History. One of the salient features of the Ministry of Buddhism and Confucius is that there is no mention of Trinity, Original Sin or other dogma of Christianity, but the Monotheism of Judaism and Islam can be traced into these teachings that have gone through changes over time. Additionally the insightful Prof. Mark Muesse describes Paul to be the founder of Christianity rather than Jesus himself. The shear act of putting the four sages in one bracket serves to raise the reader above many contemporary Western prejudices. As religion comes to occupy the forefront of the socio-political stage, the academic arena, which has always been enamored with religious discourse, has now begun to dissect the purpose of religion: What each faith has to offer and what religion offers, on the whole, to humanity. Professor Mark W. Muesse in his set of lectures entitled “Confucius, Buddha, Jesus, and Muhammad” does precisely this. He considers the teachings of each of these men in light of their historical context and personal circumstances, and tries to redefine each man’s character based on his intent and action, rather than the persona imposed upon him by his followers. He acknowledges that western media’s portrayal of Prophet Muhammad has been unfair particularly his teachings regarding women’s rights and warfare. Professor Mark W. Muesse proves himself to be a fine scholar who aims to understand what these four men had to offer to their followers, and thus how they acquired the great following that they did, and what their teachings can offer to humanity as a whole. He strives to understand their socio/political endeavors in light of their historical contexts and personal circumstance. His work is a rare glimpse into the actual struggle of these men to rise up out of their personal obstacles and redress the social issues of their times. Muesse’s perspective is secular, refreshingly unbiased, honest and foremost, as stated, contextual. His work is a phenomenal breakthrough in the study of religion, as he lays out the teachings of these men, not as their followers understood them, but as these four men intended them to be understood. Muesse has done what few scholars have managed to do: set aside his contextual time period and re-enter the time period of the great personalities he studies. As the world sees the re-emergence of religion, and witnesses a rising fundamentalism within every faith, and academics and scholars struggle to understand this re-emergence that has occurred despite the prevailing scientific order, Muesse offers his readers a profound window into humanity’s need and struggle to follow a path of nobility, as embodied particularly in the historical characters of these four sages. As just one measure of their importance, current rankings of the most influential people in history consistently put Confucius, the Buddha, Jesus, and Muhammad at or near the top of the list. Four centuries after the rise of the scientific worldview, their influence in human affairs continues to be fundamental, underscoring issues ranging from questions of ethics and justice to religious and political conflicts to other issues that dominate today’s headlines.